Matthew Peterson: Now, as a bonus question, what is it like to be married to an author? [laughs] Both of you are authors. Peter Morwood: It’s simpler than you think. Diane Duane: It’s simpler than NOT being married to one. Peter Morwood: Yes! Absolutely. It saves the time that otherwise would have been taken up in explanations. Peter Morwood: What are you doing at 3 o’clock in the morning scribbling in that notebook? Is there somebody I should know about? Peter Morwood: Yes, you do know about them. They’re in chapter 7 of the next book or whatever. Diane Duane: Why are you staring out the window like that? And while you’re not doing anything would you take the garbage out? The point is of course when you’re staring out the window like that you’re working. And if you live with ordinary normal people, you have to explain this to them all the time. Peter Morwood: Everyone seems to think that a writer hard at work goes tappy-tappy-tappy-tappy-tappy-tappy-tappy. [pretends to type on a keyboard] No, that’s only the writer getting down what they have assembled either in a notebook or in other ways. Diane Duane: Yeah. And what looks like work for writers, other people will routinely, you know, mistaking it for wool gathering or just sitting there with you tongue hanging out, [laughs] drooling slightly. Diane Duane: Yeah. That’s exactly right. Peter Morwood: Or going alone and knowing that you’ve left your significant other behind, twiddling his or her thumbs. We’re a package. What we were doing, at this particular convention, of course, was teaching a writing workshop amongst other things. And Diane is more science oriented, I’m more fantasy oriented. We go down the middle when it comes to historical and non-fiction material, so they’re getting a big comprehensive package. Matthew Peterson: [laughs] You’re always going to get something good. Diane Duane: No, we have a lot of good information, especially when we’re teaching workshops like this. That we’ve come by working both sides of the field, both film and prose. And it’s a pleasure to be able to pass that stuff along. Matthew Peterson: I think the interview was definitely better by having both of you in it. Matthew Peterson: ‘Cause you’re very dynamic--both of you together. Diane Duane: Yeah, we have a good time. Matthew Peterson: And I remembered it. Peter Morwood: That sort of table tennis effect. Matthew Peterson: When you were here last time, I remember you were both together at one of the panels and I remember you did very well together. Diane Duane: Absolutely. But it’s fun. Matthew Peterson: I remember reading the first one or listening to the first one, So You Want to Be a Wizard. And I remember hearing that way back a long time ago and I was like, “It’s time for me to read that one.” It’s been a long time. I’d been seeing that around and I remember that there was a book that she . . . Kit was the main character in it? Diane Duane: Nita, yeah, yeah. Matthew Peterson: Nita, okay. She found the book and the book changed: the covers, the title changed. Diane Duane: Sure, the book changes itself to hide itself when necessary. It grows or shrinks depending on how much information you need to be carrying at any given moment. If you’ve been researching on something, that part of the book will fill out more as you work. But generally speaking, when you need a spell, when you go looking for it, you find it. Assuming you’re authorized to have access to that kind of of power. Matthew Peterson: Now, A Wizard of Mars is coming out. Matthew Peterson: Are there going to be more? Diane Duane: Yeah. The series is open ended. I have no intention of stopping them until I’m bored with writing them, and I can’t think when that will be. Peter Morwood: You just signed a new contract . . .
Diane Duane: We just signed the contract for the next one--will be called Games Wizards Play. Matthew Peterson: And when a film comes out or whatever productions going to come out, I can imagine more demand as well for additional stories. Diane Duane: Oh, yes, it’s usual. Matthew Peterson: Do both you and Peter... Do you have anything in the works together? Working together on another book? Diane Duane: We’re working on some television stuff. Peter Morwood: Yeah. The Rollen Project. And when I said Greek and Roman he sort of lit up a bit and said, “You know, I think that the sword and sandal genre is heading for a renewed popularity.” As I say, this was long before Gladiator. Gladiator came out in 2000, 2001? Peter Morwood: This conversation took place in around about 1994, ‘95, so the man was prescient to a degree, as well we’ve had 300, we’ve had Troy, we’ve had all that lot. Peter Morwood: And after Gladiator came out, I got a phone call from my agent saying, “Do you still have the Games project material to sort of hand over to someone else?” And as it happened, I still had it to hand. But first I phoned the agency back to make sure that it was actually them. Because I have some friends with a sense of humor. Diane Duane: Getting a phone call from Hollywood after such a long time--a town that is famous for short memories--is a bit surprising. Peter Morwood: So what we turned our minds to was dealing then with a lot of information that pops up on History Chanel, the Discovery Chanel and on, all about the “Gladiators are different to what you know from Sparticus and Dimitrius” and the Gladiators and so on and so forth. In that they didn’t always kill one of the pair. In fact, that was very infrequent. That gladiators had, among other things, work related insurance, which brought me up short when I read about it. Peter Morwood: That gladiators sponsored things, brands of olive oil. That there were sports bars in ancient Rome where you could come along and be seen with a famous gladiator. Matthew Peterson: This is like a historical thing? Peter Morwood: This is all historically accurate. Diane Duane: This is not new information. This has been known from what they’ve learned . . .
Peter Morwood: It’s evidently new to a lot of folks in Hollywood as well, because a lot of research in major motion pictures seems to be to watch the previous motion pictures set in the same Roman period [laughs] and take it from there. The bible, the production project bible, that we finally assembled had so many things that dealt with something people “don’t know” about gladiators or about chariot racing or about the infrastructure of the Roman games that we had to cite and footnote every reference to prove that it was real and not something we were making up. Diane Duane: Oh yeah, verify and completely annotate everything. Peter Morwood: And illustrate it as well if possible. The end result looked more like a doctoral thesis than something you’d send to a Hollywood producer. And one thing and another happened and the early Games project in 2003 fell apart. We ended up writing a mini-series for a German production company which was in fact successful and reached the screen. It was called Sword of Xanten in the UK, Dark Kingdom: the Dragon King here. 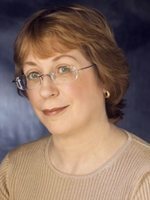 Diane Duane: Syfy [formerly the Si-Fi channel] shows it. Matthew Peterson: Yeah, I saw it. Peter Morwood: It pops up again. But now the Games project seems to be rattling its cage again. So we have been going through it, revising it based on new historical information: changes in the dramatic side of the plot and we’re waiting for the Hollywood entity that asked about it to possibly bite. Matthew Peterson: You’ve got the screenplay and all that? Or just the main ideas? Diane Duane: Not the screenplay. Peter Morwood: Not the screenplay yet. What we’re doing is the story arcs of the first. . . the full story arc of the first year and the lightweight story arcs for the subsequent five years. In something like this, you always look towards a syndication package. Matthew Peterson: Yeah. Would you two be doing the screenplay? Peter Morwood: Yes. Well, at least having the first crack at it. Diane Duane: No, no, we’re doing it. Matthew Peterson: You ARE doing it. Yeah. Matthew Peterson: Your books are not quite young adult, though, are they? Peter Morwood: No, they’re not. There was one review I saw when the omnibus issue came out a couple of years ago, where someone was complaining about the level of violence in the fourth edition. Diane Duane: Yeah. No, they’re . . .
Peter Morwood: No, they’re aimed at adults. Peter Morwood: At least certainly people who are old enough to vote. Matthew Peterson: Let me make sure your website was up-to-date. Diane Duane: For me, it’s 50 books. Peter Morwood: For me it’s only . . . a dozen. Diane Duane: Twelve or . . .
Peter Morwood: So entertain yourself. Diane Duane: Yeah, ‘cause if you don’t, no one else is going to like it. If you don’t entertain yourself first, when you’re writing, the audience is going to realize that you weren’t having fun when you wrote this, or you weren’t fully engaged with the material. And they’re going to come away cold. And it’s always detectible.